BEIJING: China ramped up security along its border with North Korea, installing new surveillance cameras, deploying extra security forces and operating radiation detectors as it braces for a potential crisis. Bellicose rhetoric between Washington and Pyongyang has raised fears in China of a conflict that could send millions of North Korean refugees across the 1,420-kilometre (880-mile) border, and of nuclear fallout that could hit Chinese towns. While authorities have been coy about preparations, residents have seen an increase in patrols along the frontier. Radiation monitors are running in border towns, and locals say interactions with North Koreans have been discouraged. Outside Dandong, new checkpoints dot the road running along the Yalu River. Locals say they were installed in October. “Before, the North Koreans came to our side to fish. Now they don’t dare,” said Zhang Fuquan at his fish farm on the Chinese side of the Yalu River. On the opposite bank, North Korean soldiers peered out from turquoise watchtowers and at least one warplane surveilled the territory from above. Experts said the aircraft, spotted by an AFP reporter, was a Stalin-era Ilyushin Il-28 light bomber or a Chinese copy. “The North Koreans very likely are flying a patrol along the Yalu,” said Rick Fisher, a fellow at the International Assessment and Strategy Centre, a US-based think-tank. Relations between China and North Korea have deteriorated as Beijing has backed a series of UN sanctions to punish its secretive ally over its repeated missile and nuclear tests. In a previously unthinkable meeting, top US diplomats and military officials told their Chinese counterparts last year about US plans to send troops to North Korea and secure its nuclear weapons in case the regime fell. “The China-North Korea relationship has some problems at present,” said Yang Xiyu, a former Chinese negotiator on Pyongyang’s nuclear issue. At the massive Sup’ung hydroelectric dam, which provides power to both China and North Korea, surveillance cameras monitor the Yalu River. “The border is tightly controlled now,” said 75-year-old Yin Guoxie, retired from a lifetime of work at the dam. Yin said regular North Koreans are not allowed to have boats, minimising the number who try to cross. “If they do come over here, we’ll catch them and send them back,” he added. Further north in Longjing, where the Tumen River freezes over in the winter, villages have established border protection units and cadres have taught self-defence to residents. The local propaganda department said last year that hundreds of cameras were being installed to build a “second generation border surveillance system”. The measures are slashing the number of North Korean defectors who reach Seoul via a land route through China to Southeast Asia. Fewer than 100 North Koreans a month reached the South last year – the lowest number in 15 years – according to Seoul’s unification ministry. 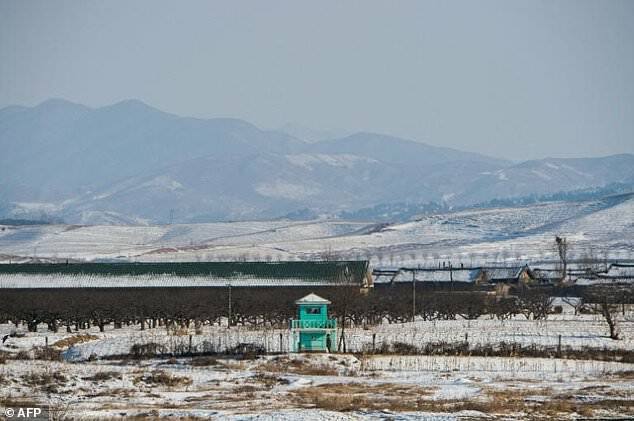 Five of Pyongyang’s six nuclear tests have been carried out under Mount Mantap at Punggye-ri, some 80 kilometres from the border with northeast China, where citizens felt the accompanying earthquake. Some Chinese and foreign scientists worry that the 2,200-metre peak suffers from “tired mountain syndrome” and could collapse from further nuclear tests. Fear of radiation from a test, accident or nuclear war spreading to China’s border regions runs high. After Pyongyang’s sixth nuclear test in September, China’s Ministry of Environmental Protection conducted emergency radiation monitoring, though nothing abnormal was found. At the Dandong border crossing, authorities last week checked to make sure their nuclear radiation monitoring and protection equipment was working properly. Further afield, in Lagushao village, AFP reporters saw a whirring “Radiation environment automatic monitoring station” housed inside a hut. Guo Qiuju, a professor at Peking University, said the station was capable of detecting radiation coming across the border. “If the monitoring stations show any abnormalities, we will immediately alert citizens,” said Guo. The Lagushao station is not listed on the environment ministry’s online network, suggesting it may be new. The ministry did not immediately respond to faxed questions for comment. Last month, a state-run newspaper in the Jilin border province published a full-page illustrated advisory detailing how to response in the event of a nuclear attack or disaster. “If there is a river, lake or pond near you, jump in to protect yourself,” it read.